Israeli leaders express shock, outrage after vandals desecrate Jerusalem synagogue named after French rabbi killed in terror attack. Israeli leaders expressed shock and disgust Tuesday morning, following the discovery that the Siach Yisrael synagogue in Jerusalem had been vandalized overnight. The synagogue, which is associated with the French immigrant community in the Kiryat Yovel neighborhood, dedicated its sanctuary in honor of Rabbi Yonatan Sandler, a French-Jewish victim of Islamic terror. Sandler, a 30-year-old French rabbi, was murdered along with his two sons in a terrorist shooting attack in May 2012. 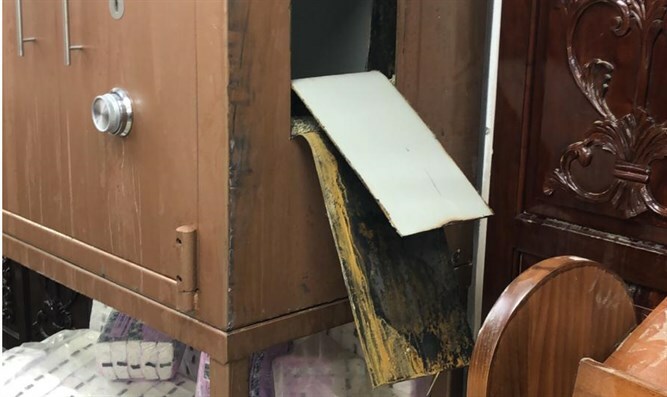 Vandals broke into the synagogue Monday night, cut open the Torah ark, and ripped out the Torah scrolls. Numerous prayer books were also vandalized, as was the synagogue’s furniture. Interior Minister Aryeh Deri (Shas) called the desecration a “pogrom”, and called on police to bring the perpetrators to justice. Agriculture Minister Uri Ariel (Jewish Home) said the attack on the synagogue was reminiscent of the “worst days” in Jewish history, noting that just this week the world observed International Holocaust Remembrance Day.